Imam Tawhidi is an Australian Muslim Scholar, Publicly Ordained Islamic Authority, Thinker, Educator, Speaker, and one of the main leading voices in the global movement of Islamic reform who has dedicated his life to ideologically tackling the spread of Islamic Extremism. He was born in the Holy City of Qum, Iran, into a spiritual family with a history of decades in the Islamic Seminary, and had memorised half of the Quran by the age of nine. Between 2010 and 2014, Imam Tawhidi was labelled as Hujjat al-Islam by over five Grand Ayatollahs in their licenses to him. His father Imam Abdulmutalib Tawhidi served as the Senior Imam of the Shi’a Muslim Community in Western Australia, and was the first to establish a Shi’a Mosque in the entire state (Saint Mary Mosque). Imam Tawhidi’s lineage includes several Grand Ayatollahs, Arabian Legends such as Hatam al Ta’ei and Prophets Hud and Noah. He is also the maternal grandson of Shaikh Yasin al Rumaithi, a prominent Iraqi eulogist and orator within the Shi’a faith. Imam Tawhidi completed his initial studies in Perth, Western Australia, and engaged in Islamic studies, Doctrine, Philosophy and Theology in the Islamic Seminary of the Holy City of Qum, Iran, as of January 2007. In the year 2012, he attended the advanced lessons of the Grand Ayatollah Sayid Sadiq Shirazi in jurisprudence and principle, and was advised by his eminence to relocate to the Holy City of Karbala in the year 2013. He studied under the authority of prominent teachers in both the Islamic Seminaries of Karbala and Najaf, of them are Ayatollah Shaikh AbdulKareem al Ha’eri. 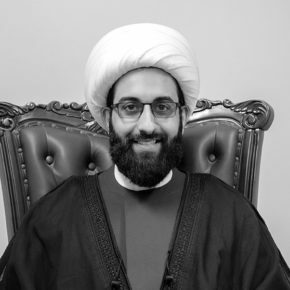 Imam Tawhidi returned to Australia in 2015, after his journey in the Islamic Seminaries of Qum, Najaf and Karbala, and is considered an internationally active personality being fluent in Arabic, English and Farsi. He has delivered speeches at conferences, Parliaments, Mosques, Islamic centers, Churches, Synagogues, Temples and Universities across the Middle East, Europe, America, Asia, Australia, USA and Canada. He has delivered university lessons in doctrine and theology examining the theory of evolution, oneness of existence and the big bang theory. His activities also include the administrating of Islamic Centres, websites, the publishing of books and delivers weekly theological, doctrinal and Jurisprudential lectures in universities and centres within Australia. Imam Tawhidi is licensed by numerous Grand Ayatollahs and leaders of Islamic Seminaries to lead and represent the Muslim community. He currently holds the position as the President and Imam of the Islamic Association of South Australia and The Imam Tawhidi Foundation. He enjoys healthy international diplomatic relationships with numerous government officials and provides regular advice on counterterrorism. Click here for Imam Tawhidi’s views on key issues. © 2019 All Rights Reserved by The Imam Tawhidi Foundation. ABN: 58301338779.